Leehom was in town for a duration of less than 20 hours yesterday to help boost his upcoming Music-man II concert sales. There is only one event scheduled during his short duration in KL and it was held in Kenanga Wholesale City. We went to the airport for his arrival and I think he was in a good mood and we got ours albums and other stuff signed! hahaha... The last time I went personally to get his autograph was in 2009 after his Music-man concert. hehe..
10am - Kenanga Wholesale City Level 15, where the promo and public press conference was held. About 11.30, Leehom made an appearance. Reporters asked questions, followed by a few fans... Photo taking session with the sponsors. 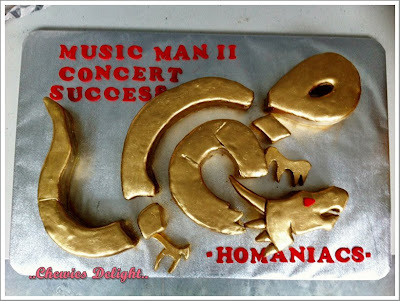 My friend, KC made a 'Dragon treble clef shaped cake' for him and presented to him on stage together with Joanne, the club president. Collecting one stack before distributing them to the audience. One last pic of my signed 'Heroes of Tokyo' book and 火力全开 album before I conclude this entry.